The newly drafted fire safety regulation in UAE was introduced in January 2017. The new guidelines highlights safety of all the individuals of the country from any kind of fire incidents causing loss of life and property. The demand for fire safety systems and equipment in UAE would continue to grow in the future on the back of infrastructure expansion and stringent regulations. According to 6Wresearch, UAE Fire Safety and Equipment market is projected to grow at a CAGR of 10.1% during 2017-23. Fire safety systems and equipment market in UAE is expected to spur in the coming years owing to numerous infrastructure projects worth more than $400 Billion, which are lined up in Dubai alone for World Expo 2020 and for Dubai Plan 2021. The Northern region, driven by the growth in the Dubai accounted for the largest share in the fire safety systems and equipment market in 2016. The Southern region would also witness steady growth due to the development of tourism sector in the region. Some of the key players in UAE fire safety systems and equipment market include NAFFCO, Tyco, UTC, FireX and SFFECO. The report thoroughly covers the UAE fire safety systems and equipment market by types, by verticals and by regions. The report provides an unbiased and detailed analysis of the on-going trends, opportunities high growth areas, market drivers which would help the stakeholders to device and align their market strategies according to the current and future market dynamics. • Historical Data of UAE Fire Safety Systems & Equipment Market Revenues for the Period 2014-2016. 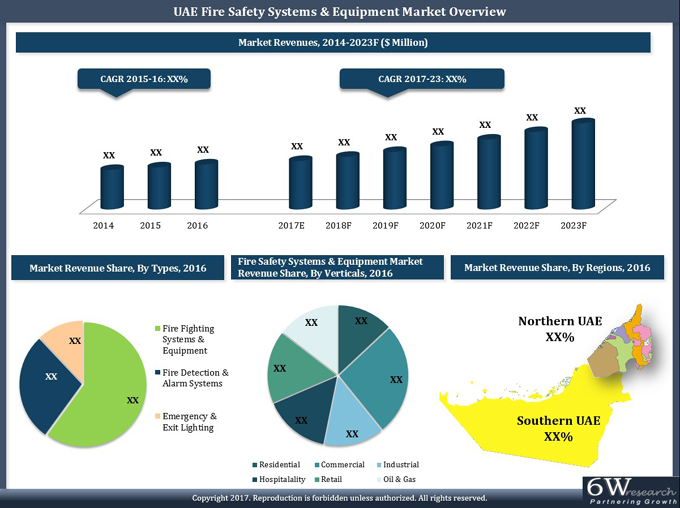 • Market Size & Forecast of UAE Fire Safety Systems & Equipment Market Revenues until 2023. • Historical Data of UAE Fire Safety Systems & Equipment Market Revenues by Types for the Period 2014-2016. • Market Size & Forecast of UAE Fire Safety Systems & Equipment Market Revenues by Types until 2023. • Historical Data of UAE Fire Safety Systems & Equipment Market Revenues by Verticals for the Period 2014-2016. • Market Size & Forecast of UAE Fire Safety Systems & Equipment Market Revenues Verticals until 2023. • Historical Data of UAE Fire Safety Systems & Equipment Market Revenues by Regions for the Period 2014-2016. • Market Size & Forecast of UAE Fire Safety Systems & Equipment Market Revenues by Regions until 2023. • Player Market Share and Competitive Landscape. 15.7. Nitin Fire Protection Industries Ltd.
15.8. Saudi Factory For Fire Equipment Co.